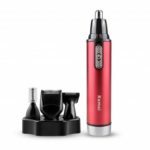 The KM – 1407 Hair Trimmer is a 3-in-1 electric tool for trimming beard, hair, nose and also with ear hair. 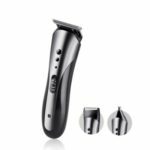 It allows the entire head to adjust to any angle and the active contour and keep the blades in close contact with your face, ensuring reduced irritation and an accurate shave. Now, enjoy an excellent cutting experience! 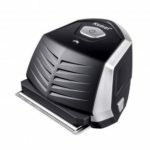 3 precise trimming blades design on different areas for a close, comfortable and efficient shave. Trim hair and make sorts of length (3mm/6mm/9mm/12mm) easily. 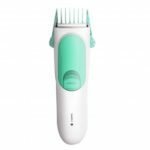 Features cramped trimming heads, quickly and painlessly grabs and removes the unwanted hair. You can charge the built-in power supply and use at the same time, it also can be used cordlessly after charging. Gently move the product around to trim all the unwanted hair in your nose/ears. 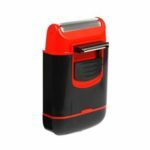 Slowly move the shaver back and forth against the growing direction of beard hair, can also be shaved on the neck along in this way. 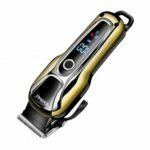 Cut hair to the correct length by moving the clipper back against the flow of the hair.